In 2009, one of the largest German events celebrating the 150th anniversary of Darwin’s book, On the Origin of Species, was headed up by Dr. Günter Bechly, a world-renowned paleontologist with an incredibly impressive list of original research published in the peer-reviewed literature. At the time, he was the curator of the Stuttgart Museum of Natural History, and he wanted to show, in no uncertain terms, that there is absolutely no scientific dispute about origins. 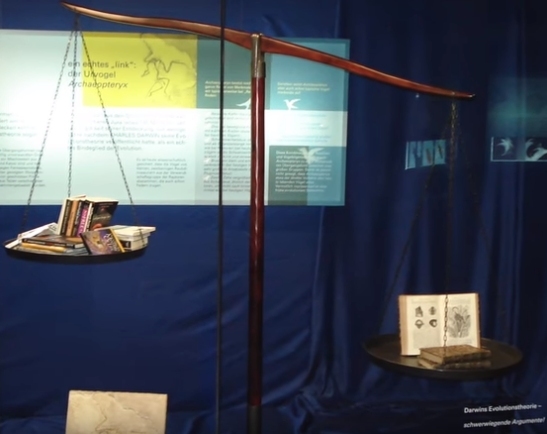 As a result, one of the displays in his museum’s celebratory exhibit (shown above) was a scale with creationist and intelligent design resources on one side and Darwin’s book on the other. Darwin’s single book tipped the scale, indicating that the weight of the scientific evidence was in evolution’s favor. …and what I recognized to my surprise is that the arguments I found in those books were totally different from what I heard either from colleagues or when you watch Youtube videos where the discussion is around intelligent design versus NeoDarwinian evolution. And I had the impression on one side that those people are mistreated – their position is misrepresented and on the other hand that these arguments are not really receiving an appropriate response. And they have merit. He ended up being scientifically convinced that Intelligent Design is the better explanation for the amazing world he had been studying his entire career, and he made that decision public in 2015. Then he faced a firestorm. His requests for new fossil material were blocked. He received an announcement that one of the most important positions in his research staff would not be refilled when the current employee retired. The large amber collection he was responsible for was moved from his office. He was told that he must resign from the German Research Foundation, which directs the allocation of certain research funds. He was told that he was a threat to the credibility of the museum and that he should quit. The museum then deleted his pages from their website, despite the fact that they said nothing about Intelligent Design. It then dismissed him as the head of a major exhibition that he had designed, despite that fact that he was the resident expert on the subject. Eventually, it became clear that he would no longer be allowed to do the research he wanted to do, so he resigned from the museum. He is now a Senior Fellow at The Center for Science & Culture, an Intelligent Design Think Tank. In other words, the High Priests of Science marshaled The Inquisition against him. When a scientist of his caliber is convinced by the arguments of the Intelligent Design community, he must be silenced. After all, the official pronouncements from the Holy See of Science is that there is no debate on the validity of NeoDarwinian Evolution. An accomplished scientist who used to parrot that pronouncement and now says it isn’t true must be excommunicated. Otherwise, his heresy might spread! I’m coming from a family background which is totally secular, agnostic. [I] was not baptized, didn’t join any kind of religious education, never went to church, so I was completely irreligious. [I] was not even interested for most of my life in philosophical or metaphysical questions. I was interested in nature, in animals, and natural sciences. Much of Dr. Bechly’s spiritual journey is similar to mine, even though I have always been interested in philosophy and metaphysics. He examined the data and ended up realizing that there had to be a Designer who fashioned the amazing world that we scientists study. He eventually came to realize that this Designer is the God of the Bible. That’s pretty much what happened to me. While the High Priests of Science will try to censor any scientist who has the audacity to follow the data against their pronouncements, they cannot keep the truth hidden. Those with Dr. Günter Bechly’s intellectual integrity and courage will find it. Thank you for maintaining this series. It is always encouraging to hear that God is having victories in the hearts of men! Thanks for posting this. There are a few YT videos in which Dr. Bechly speaks at length regarding his views and even some of the honest evidence he sees of evolution. I see him as a person of extreme honesty and forthrightness. The story itself is fascinating… Definitely a little bit of Saul in there. Back in 2001, I spoke at the University of the West Indies in Barbados. At that time, the university had a yearly lecture series where they brought in an advocate of an idea that went against the current academic consensus. I was invited to lecture on young-earth creationism. I told them in my first lecture that Barbados has more academic freedom than the U.S., because no state-run university in the U.S. could ever sponsor a young-earth creationist to do a lecture series advocating for young-earth creationism. In my experience, U.S. universities have a DISMAL record when it comes to academic freedom. Do you think the Kitzmiller v. Dover decision was an infringement on academic freedom, or unjust in any other capacity? Academic freedom is very difficult to preserve in public secondary schools. The problem is that a public secondary school, by necessity, must “toe the party line” when it comes to what the state wants its citizens to know. Thus, if the state wants its students to be ignorant of alternative views in science, it isn’t an infringement on academic freedom to require that such views not be taught. It is reckless and stupid, and it makes for a less intelligent public, but it is not an infringement on academic freedom, because technically, there is no academic freedom in a state-run secondary school. 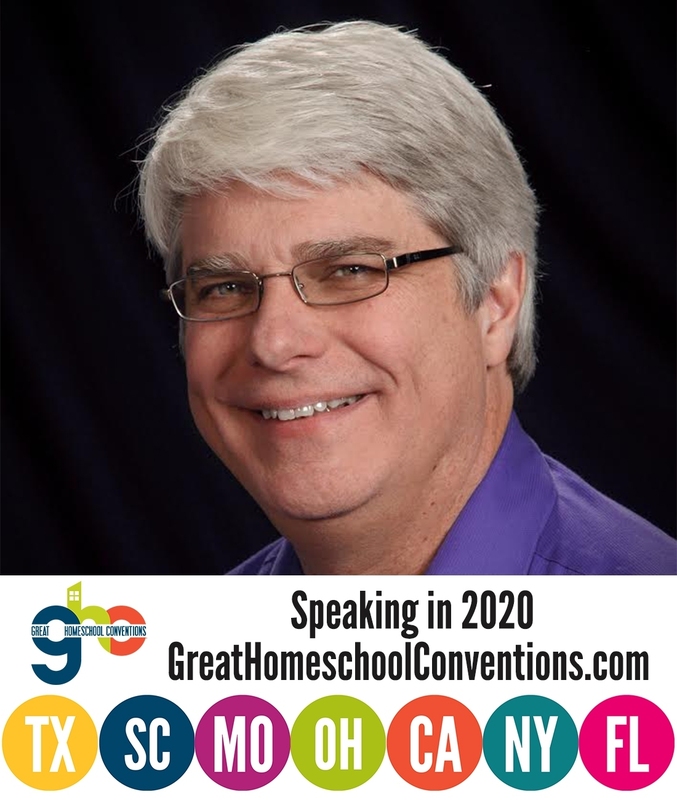 If parents want academic freedom, they should turn to private schools or homeschooling. I think the latter is the superior choice for education anyway, so by choosing homeschooling, you not only give your children a superior education, you also have academic freedom. The most obvious problem with the Kitzmiller v. Dover is that it was written by a lazy judge who either didn’t pay attention to the testimony or ignored it. This is easily demonstrated, since 90% of the ruling comes directly from an ACLU brief that was written BEFORE the trial. You can also read several articles that show how the testimony was ignored. No, not unjust. That decision had nothing to do with academic freedom. No one was prevented from going where the facts lead; in fact the opposite was largely true. Huh? Science must be taught in science class–that’s the “party line.” The state doesn’t decide what science is, the scientific community does. Wait . . . you’re not saying that Intelligent Design is an “alternative view” to evolution, are you? Evolution is the scientific consensus. Academic freedom is what professors have when they can speak about whatever they want (outside of their teaching duties) without fear of censure. It doesn’t really apply in K-12 education, where a syllabus is given to the teachers. Evolution is the scientific consensus, and laypeople have no option but to accept it as the best provisional estimate we have for the truth. That consensus may change in the future, of course, but it’s the best we’ve got. Yes, Bob, Intelligent Design is a scientific alternative to evolution, and as a scientist, I think it is a better alternative than materialistic evolution. I agree that evolution is the scientific consensus, but the scientific consensus is often wrong, and the greatest scientific advancements have come as a result of scientists who challenge the scientific consensus. In the case of state-run education, the state most certainly does determine what is science, since there is a wide variety of opinions on origins among scientists. If we taught what scientists think about origins, we would be discussing many alternative views, including Intelligent Design and creationism. Instead, the state steps in and says that it doesn’t want students thinking for themselves, so it makes the decision about what should be taught in science class (and the other classes, for that matter). A few years ago, I wrote an article titled, “I used to be an atheist just like you”. If you’re curious, search for it online. In short, I argue that no atheist like me (that is, well educated about the apologetics argument pro and con Christianity) ever becomes a Christian for intellectual (rather than emotional) reasons. Thanks for your comment, Bob. I read your article (and it’s follow-up) and will have to disagree. I do think you run the risk of the “No True Scotsman” fallacy the way you set up your argument, and it can certainly be turned around. I could easily say that all the examples of Christians-turned-atheists that you give are also not “well-informed” Christians. In addition, I think it’s hard to change a person’s mind once he or she has listened to all the arguments and made a decision. However, I do think it happens. I have several examples, and many of them seem to have come to faith as a result of intellectual arguments. I am sure there are emotional reasons involved as well, since we are all emotional people. I assume that’s also true of Christians-turned-atheists. When it comes to worldview decisions, it is very difficult to disentangle intellectual and emotional motivations. However, I do think that for some converts from atheism to Christianity, the deciding factors are intellectual. That was certainly the case for me, and it seems to be the case for others, some of which I have discussed here. Jay: Thanks for the reply. My argument has the weakness that I know of only a small number of conversions either way, and there could be a counterexample to my argument (which is: no one becomes a Christian (1) who is well informed on the arguments both pro- and con-Christianity and (2) who does so for intellectual rather than emotional reasons). But as my blog says, I take a “you will know them by their fruits” response. Given the poor state of Christian education within Christians (to which I imagine you agree), I’d suspect that that’s true for most conversions! My challenge is this: if there was an atheist who (1) knew the arguments well on both sides who (2) converted for intellectual reasons, then he’d know why the dozens of arguments that I point to are all (or mostly) wrong. I know that if I became a Christian for intellectual reasons, I’d be very motivated to go back and revisit all those arguments and point out the flaws in my atheist interpretation of them. Where is this rebuttal? Not seeing it, I am assuming that no such convert to Christianity exists. If you want to encourage your atheist-turned-Christian examples to respond to the arguments on my blog, have at it. It’s the Cross Examined blog at Patheos. They may be, though (as in the case of Antony Flew) that doesn’t mean that he actually understands the arguments. Once again, Bob, I will have to disagree. I have seen many atheist arguments, and they all have sound rebuttals. You may disagree with those rebuttals, of course, but that doesn’t mean they aren’t sound. I know that in my case, I thought I had good rebuttals to the argument from design, but that’s just because I didn’t know much science. The more science I learned, the harder it was to believe the rebuttals, so I ended up changing my mind. I suspect that’s what happens in a lot of cases. The more you learn about a subject, the weaker some arguments become and the stronger other arguments become. The more educated I became, the weaker the atheist rebuttals became, and the stronger the theistic arguments became. This sidesteps my argument. Let me repeat it: if *I* became a Christian for intellectual reasons, the first thing I’d do is summarize all the errors in the arguments I made. I’ve never seen anyone do this. Sound rebuttals that I would agree with (because I would’ve written them)? I haven’t seen this. If you think you have compelling arguments, you’re welcome to come to my blog and browse for arguments. Pick the ones you think you’ve got the most compelling response to. I am not sidestepping anything, Bob. I am just saying that good rebuttals to atheist arguments do exist, regardless of whether or not you want to accept them. For example, in your blog, you talk about divine “hiddeness” as the “most powerful argument against Christianity.” However, God is not hidden at all. Indeed, everyone (even atheists) contemplate His existence at some point in their lives. If something is hidden, how in the world can we even contemplate it? In addition, He has given us lots of evidence for his existence, such as the amazing design we see in nature. When I look at the world from a purely scientific point of view, I cannot help but come to the conclusion that God exists and is not hidden at all. I suspect that this is part of why Dr. Bechly is a Christian today. You obviously come to a different conclusion than me and Dr. Bechly when looking at the same evidence. Does that mean one of us is not “well informed.” Perhaps, but I would submit that it could very well be you. The more science I learn, the more evidence I see for God’s existence. That’s why I started believing in God. I didn’t want to believe. I was drug there by the evidence, kicking and screaming the entire way. So from where I sit, the more “well informed” I became, the more I saw that God is not hidden at all. And I disagree. So are we at an impasse? No, and that’s the approach that I take in the argument summarized in “I used to be an atheist just like you.” Take the atheists with roughly my knowledge of the apologetic arguments pro and con. There are perhaps millions. Now look at just the many thousands who like to write about it. If any of those gradually realized that all those arguments were wrong (that is, found intellectual arguments for Christianity), he would almost surely write about it. I’d be happy to continue discussing particular arguments, but I’d rather do it at my blog. Replying to comments on yours difficult. Yes, Bob, Intelligent Design is a scientific alternative to evolution, and as a scientist, I think it is a better alternative than materialistic evolution. No one cares if you’re a scientist. Since we’re talking about biology, the only relevant qualification is that you’re a biologist. Are you? the greatest scientific advancements have come as a result of scientists who challenge the scientific consensus. Sure. When the biologists have challenged the consensus within biology and changed it, let me know. Until then, the point remains: we laypeople are stuck with the scientific consensus. In the case of state-run education, the state most certainly does determine what is science, since there is a wide variety of opinions on origins among scientists. There are? Summarize this wide variety. I can only think of abiogenesis and evolution in biology. And, if we’re using a grand definition of “origins,” then perhaps the Big Bang. If we taught what scientists think about origins, we would be discussing many alternative views, including Intelligent Design and creationism. And I suppose we need to include astrology when the topic is astronomy, just to be complete? How about giving alchemy equal time in chemistry class? Since ID/Creationism are very, very much not the scientific consensus, no, they wouldn’t be candidates for biology class. 1. The state simply wants the best science taught in the science classroom. The state doesn’t “step in”; it simply demands that the consensus view be taught. This is a no-brainer—what else but the consensus view would they teach?? 2. What does “think for themselves” mean in this context? That they’re going to invent their own science or history or English? Un, no—while we do want to encourage independent thinking and model that for the students, when the chemistry teacher says that oxygen has 8 protons, that’s just a fact that the students need to accommodate themselves to whether they like it or not. If you are a lazy layperson who doesn’t want to think for him/herself, then you have no choice but to accept the scientific consensus. The Argument from Ego! I love it. Thanks for your reply, Bob. I am sorry that I have made you angry. Perhaps my reply will help clear things up. You say that no one cares if I am a scientist. I will have to disagree. The National Science Foundation cares. That’s why it gave me $200,000 in research grants so I could do original research. Journals like The Physical Review, Nuclear Physics A, and Nuclear Instruments and Methods, care because they have published my original research. So I assure you, some people do care that I am a scientist. Now, you claim that my views about evolution are meaningless because I am not a biologist, but that’s not a very honest argument, is it? After all, there are a lot of biologists who see Intelligent Design as better alternative than evolution. Biochemist Dr. Michael Behe, microbiologist Dr. Scott Minnich, Geneticist Dr. Wolf-Ekkehard Lönnig, evolutionary biologist Dr. Richard Sternberg, paleontologist Dr. Günter Bechly, and many other Ph.D. biologists think intelligent design is a superior alternative to materialistic evolution. I suspect you would consider their views meaningless as well. So it’s not really a question of my scientific speciality, is it? In fact, scientists often cross the lines of their speciality when writing and doing research. Indeed, the former chair of the molecular biology department at the University of California Irvine (Dr. Jerry Manning) is a physical chemist. Why was he the chair of the molecular biology department? Because he published a very important paper in gene mapping at the chromosome level. His speciality was physical chemistry, but he published in the biology literature and ended up spending most of his career doing molecular biology. In the same way, while I am a nuclear chemist, I published a peer-reviewed paper on the catalysis of gas-phase reactions, something that has nothing to do with my speciality. I am currently doing original research (with the help of one of my university students) on the formation of limestone grains. Once again, it has nothing to do with my area of expertise, but because I have been trained as a scientist, I can apply my training to many other fields. You ask what alternative we have to the scientific consensus. That’s easy. The alternative is to examine the evidence and think for yourself. We don’t have to blindly follow what the High Priests of Science say. We can look at the evidence and make our own decisions. You seem to think that the only motivation someone would have for going against the scientific consensus on origins is a religious belief. However, that’s not true in at least two cases. First, my religion is completely compatible with evolution. Indeed, at least two of my former pastors believed that evolution was the method God used to create. I could be perfectly content as a Christian who is an evolutionist. My problem is that I cannot be content as a scientist who is an evolutionist. Second, Dr. David Berlinski describes himself as a secular Jew, but he is convinced that Intelligent Design is a better scientific alternative than evolution. You ask me to let you know when the biologists have challenged the consensus and changed it. I can certainly tell you that the former is happening right now. Scientists such as Dr. Douglass Axe (molecular biologist), Dr. Michaele Behe (biochemist), Dr. Scott Minnich (microbiologist), Dr. John Sanford (geneticist), and Dr. Rob Carter (marine biologist) are all publishing in the peer-reviewed literature, criticizing the consensus. I suspect that they will eventually change the consensus, since the data support their views better than the data support the consensus. However, science moves very slowly. It took about 2,000 years to debunk the scientific notion of spontaneous generation, so it might take a few hundred years to debunk the scientific consensus on origins. You seem to have a very narrow view of what scientists believe about origins. There are Ph.D. scientists from all fields who think Intelligent Design is superior to abiogenesis and materialist evolution. There are Ph.D. scientists from all fields who think that old-earth creationism is a better alternative. There are Ph.D. scientists in all fields who think that young-earth creationism is a better alternative. Of course, this isn’t anything like astrology and alchemy. These are all highly-qualified scientists who have examined the data and reached a conclusion that is different from the consensus. That doesn’t make them non-scientists. It makes them courageous scientists who are willing to suffer hardship because they think the truth is important. They might be wrong. However, at least they are courageous. You say that the state simply wants the best science taught in the classroom, but that’s certainly not true. Many studies have shown that by teaching scientific controversies, students learn science better. Indeed, studies show that even when one of the alternatives discussed is known to be wrong, the students still learn the science better. At least according to the data, then, adding alchemy and astrology when discussing astronomy and chemistry might be beneficial! If the state wanted the best science education, it would encourage teaching controversies in all fields of science. I am not sure why you think that students would have to invent new science to think for themselves. Thinking for yourself doesn’t involve inventing anything new. It simply involves being willing to examine the evidence and draw your own conclusions. This is what scientists do every day, and if we want to train people to be scientists, we should encourage them to do just that. When I say that it is lazy to simply accept the pronouncements of the High Priests of Science, I am not making an argument from ego. I am making an argument for rationality. It is certainly harder to examine the evidence for yourself and draw your own conclusions. That leaves less time for movies, video games, etc. However, if you do that, you aren’t forced to simply accept the word from “on high.” Instead, you are exercising your brain, something that a lot of people don’t have much experience doing these days! I can examine evidence and draw conclusions. What’s awesome about this is that ANYONE can do the same thing, if he or she is willing to put in the work. That person might not end up agreeing with me, and that’s fine. However, at least he or she will have thought through the issue, rather than blindly accepting the dogma as promulgated by the High Priests of Science. You say that no one cares if I am a scientist. I will have to disagree. The National Science Foundation cares. That’s why it gave me $200,000 in research grants so I could do original research. Federal grants are great—good for you. I guess my shorthand was unclear, so let me clarify: no one cares if you’re a scientist if the topic is biology and you’re not a biologist. Now, you claim that my views about evolution are meaningless because I am not a biologist, but that’s not a very honest argument, is it? I’m a little surprised that I need to clarify this as well, but perhaps this is an opportunity to clarify as well: you may well have great insight. Your view of biology (and who knows what other topics) might be right on. But how would I (or anyone else) know?? I could just throw the dice and say, “Jay seems like a nice guy. Pretty smart. And he’s quite confident. What the heck—I’ll go with his conclusion.” But I’d be an idiot to do that. I imagine you do it the same way. You’re happy with the scientific consensus within quantum physics, even though the conclusions are absolutely ridiculous (things being in 2 places at once, quantum tunneling, quantum entanglement, etc.). Why do you go along with it? Because the people who understand the evidence (not you and me) have a consensus view. Yes, there are outliers, but the scientific community itself is the best place to have their alternate ideas evaluated. After all, there are a lot of biologists who see Intelligent Design as better alternative than evolution. As a fraction of the total? Less than 1%, I’m sure. Why would I listen to them? When they’ve changed the scientific consensus, I’m on board. I’d be foolish to do it any other way. He accepts common descent. I’m surprised you’d be on board with that. I suspect you would consider their views meaningless as well. So it’s not really a question of my scientific speciality, is it? We have a process, and I’m sure you’re more familiar with it: alternate views are considered by the scientific community. If they pass muster they will (slowly, unfortunately) make it to become a new consensus. Only then do laymen have a warrant to accept them. Once again, it has nothing to do with my area of expertise, but because I have been trained as a scientist, I can apply my training to many other fields. You may have absorbed and evaluated the evidence for evolution vs. ID better than most biologists . . . but how would I know? I listen to the consensus. You ask what alternative we have to the scientific consensus. That’s easy. The alternative is to examine the evidence and think for yourself. This is the Appeal to Ego again. “C’mon, Bob! You’re a smart guy! You can evaluate the evidence yourself. Why believe something just because those eggheads told you to?” I believe what the eggheads tell me because I can’t evaluate the evidence myself. I’m not a biologist, remember? Let’s have some humility about our ability. Why do you focus on the evolution/ID debate? Why not focus on a significant issue like slapping some sense into the physicists who tell us all sorts of nonsense about the quantum world? My guess: you focus on the issues that step on your theological toes. Your religious beliefs come first, and you sort your scientific views to adapt. We don’t have to blindly follow what the High Priests of Science say. We can look at the evidence and make our own decisions. Uh . . . I think your humility may be a little low. Maybe you need to come in and have that topped up. Do you say that about everything? Do you tell the surgeon what to do? Do you go to the cockpit to give the pilots advice? If you’re a polymath who indeed is very, very good at everything, that’s great. That’s not me. And in my world, the science comes from the consensus view of scientists to me, not the other way around. I could be perfectly content as a Christian who is an evolutionist. My problem is that I cannot be content as a scientist who is an evolutionist. Just a tip from an outsider: this rejection of reality makes conservative Christianity look bad. It’s a reason young Christians are falling away. Imagine me, a not-nuclear scientist, acting as judge over your work, deciding what I will deign to accept and what you need to go back and rework. Both arrogant and unrealistic, I think you’ll agree. You ask me to let you know when the biologists have challenged the consensus and changed it. Then the path is obvious. Let’s both leave the scientific process alone, and if/when the consensus changes, I’ll will be first in line to accept it. I can certainly tell you that the former is happening right now. Any minute now, right? That reminds me of Michael Denton’s Evolution: A theory in crisis. When he published a new edition 30+ years later, the title was Evolution: Still a theory in crisis! Right there in the title is the evidence that evolution isn’t really budging! Wake me up when they do. Changing the consensus is the only way to get a thoughtful nonexpert to change. since the data support their views better than the data support the consensus. The consensus of the people who understand the evidence disagree with you. I’m amazed that this is so irrelevant to you. However, science moves very slowly. It took about 2,000 years to debunk the scientific notion of spontaneous generation, so it might take a few hundred years to debunk the scientific consensus on origins. Plate tectonics famously took about 50 years (if memory serves) to become the consensus. When the evidence is there, you may need to wait until the old guard dies off. When the evidence isn’t there . . . you’ve got a much longer wait. There are Ph.D. scientists from all fields who think Intelligent Design is superior to abiogenesis and materialist evolution. This is “A Scientific Dissent from Darwinism”? I’ll point your readers to Project Steve, which trumps that using only scientists whose names are variants of “Steve” (in memory of Stephen Jay Gould). You say that the state simply wants the best science taught in the classroom, but that’s certainly not true. Many studies have shown that by teaching scientific controversies, students learn science better. There is no controversy! Evolution is the overwhelming consensus view. It would simply be irresponsible to teach anything else. It is certainly harder to examine the evidence for yourself and draw your own conclusions. That leaves less time for movies, video games, etc. Then encourage that I get a doctorate in biology if it’s that important. Only then will I have a warrant for making independent conclusions about biology. As I have said, your argument that I can’t talk about evolution as an outsider is dishonest, because you would say that an insider can’t talk about evolution unless he or she believes in it wholeheartedly. I’m saying that we have a field of science, and the experts in that field do their best to find truths about nature. That’s why they get the big bucks. We outsiders take their conclusions as our best guess at the truth. What’s awesome about this is that ANYONE can do the same thing, if he or she is willing to put in the work. How much work are you talking about? Tell me that I need a doctorate, and you’ll at least justify the ability of the so-educated outsider to evaluate the evidence, but that’s rather unrealistic. Thanks for your reply, Bob. I am sorry that I still seem to be making you angry. That is not my intent. You ask why you should believe me. I don’t suggest that you. Science isn’t about believing someone else. It is about examining the data and coming up with appropriate conclusions based on that data. So don’t believe me. Examine the data and draw your own conclusions. That’s the foundation of rational belief. And, in fact, that’s why I accept the consensus on quantum mechanics and relativity. Yes, they both say crazy things, but the data support them. The data do not support the consensus view on origins. I reject the consensus view on origins for the same reason I accept the consensus view on quantum mechanics and relativity. You say you would be foolish to believe the biologists who reject the consensus, apparently because they make up a small minority of the total number of biologists. However, that implies science is some sort of popularity contest or, at minimum, a democratic process. It is not. It is about examining the data. I don’t ask you to believe those biologists. I simply suggest that rejecting my views because I am not a biologist is dishonest, since you reject the views of many biologists as well. Yes, of course Dr. Behe supports common descent. And yes, of course, I don’t. I don’t understand why you think that I support everything that he believes. He produces and summarizes a lot of data, and that is very valuable. I disagree with him on common descent, as do many other scientists. I guess that points out the biggest difference between you and I, Bob. I don’t look at experts and say, “I will believe what they say because they are in the majority.” I look at experts and consider their views valuable. However, I recognize that they could very well be wrong, so I draw my own conclusions based on the data. Once again, I am not appealing to ego here. I am appealing to reason. All people are capable of examining the evidence and drawing their own conclusions. You don’t have to be an expert in a field to do that. You seem to think that because I can examine the data and draw my own conclusions, that means I can’t be humble. That, of course, is nonsense. I am more than happy to admit that my views could be mistaken. That’s all that is required for humility. To say that everyone must believe what you believe because it’s the consensus sounds a lot less humble to me! I focus on the creation/evolution debate because I find it fascinating. It is a broad debate that encompasses a wide variety of scientific disciplines, and that appeals to me. If you read my blog, you will see that I discuss other issues as well. I just find this one particularly fascinating. You also seem to think that I am telling people what to do. I am not sure why in the world you would say that. I am not telling anyone what to do. I am simply sharing my thoughts on issues that are of interest to me. Now, if I think that I have something of worth to share with an expert outside my field, I am happy to share that information. I am also fine if the expert rejects my information. It’s interesting that you bring up the case of a pilot, because I have done that very thing with a pilot. I was flying in a small plane and suggested to the pilot that he might find smoother flying conditions higher up, based on the clouds that I was seeing. He agreed and changed altitude, which led to a smoother flight. However, I had flown with him several times before, and this was the very first time he had taken one of my suggestions. I was happy to help in the case where he took my suggestion, and I wasn’t at all offended when he didn’t take my suggestions. It’s not a question of telling people what to do. It’s a question of offering another opinion that might include information someone hasn’t yet considered. You say that my “rejection of reality” makes Christianity look bad. What makes Christianity look bad is people avoiding the truth because it is unpopular. I refuse to avoid a conclusion simply because it is unpopular. When I was an atheist, I rejected the consensus view on origins, because it went against the data. It was an unpopular view, especially for an atheist, but I kept it because it was consistent with the data. That didn’t change when I became a Christian. As I also mentioned, there are people like Dr. Berlinski who are not religious but reject the consensus view on origins. Does Dr. Berlinski’s rejection make secular Jews look bad? Does Thomas Nagel’s rejection make atheist philosophers look bad? You ask me to imagine you not accepting my work on nuclear science. That’s fine with me, especially if you do so based on evidence. I wouldn’t find that arrogant at all. I might even learn something from your rejection. You ask for me to “leave the scientific process alone.” I can’t do that, because I am a scientist. I am a part of the scientific process. If you don’t wish to engage in the scientific process, that’s fine. However, that’s not an option for me. It took about 2,000 years to debunk the scientific notion of spontaneous generation, so it might take a few hundred years to debunk the scientific consensus on origins. That’s definitely not “any minute now.” As a scientist, I know how long it takes to change the scientific consensus. Yes, plate tectonics took only 50 or so years to become the consensus, but it is a theory about something that is currently happening, and we can do experiments that test it directly. That’s not the case for origins. It is easy for an idea that goes against the data to survive a lot longer when it is difficult to test directly. Yes, I do know about “project Steve,” but once again, science is not about majority rule. It is about examining the data. This is why it is the most responsible thing to do to teach controversy in science. Using controversy, we can give students experience examining data and coming to conclusions. Of course, you claim there is no controversy. That’s clearly wrong, or you wouldn’t be arguing with me, and I wouldn’t be able to discuss peer-reviewed studies that challenge the consensus. However, let’s suppose you are right. Let’s suppose there is no controversy, and materialistic evolution is the only scientific view worth considering. That doesn’t matter, at least according to the data. The data tell us that when you teach science using controversy, the students learn the science better, even when the opposing idea is known to be wrong. Good science education, then, would include controversial topics, even those that are known to be wrong. I definitely don’t think you need a doctorate in biology to examine the evidence related to origins. In fact, you have actually admitted that a doctorate in biology doesn’t help. After all, the scientists I listed for you before all have doctorates in biology, and they have come to a conclusion that you think is not only wrong, but totally against science. Thus, the issue isn’t formal education. The issue is whether or not you are willing to examine the data for yourself. You say, “We outsiders take their conclusions as our best guess at the truth.” I most certainly don’t, and I don’t think any rational person should. Science isn’t about believing a group of experts. It’s about studying the data and coming to the best conclusion related to those data. It doesn’t take a scientist do to that. It just takes someone who is willing to learn. that’s why I accept the consensus on quantum mechanics and relativity. Yes, they both say crazy things, but the data support them. Do you probe into them with the same energy as you do with ID/evolution? Why or why not? The data do not support the consensus view on origins. And yet the scientific community disagrees. Which one should I go with, given that I’m not going to get that doctorate in biology and will have to remain an amateur? that implies science is some sort of popularity contest or, at minimum, a democratic process. I am an outsider to science and will always be. What’s my best route to accepting the most true statements and rejecting the most false ones? It’s to accept the scientific consensus, where it exists. rejecting my views because I am not a biologist is dishonest, since you reject the views of many biologists as well. I’m not saying, “Jay isn’t a biologist, so therefore what he says is false.” Rather, I’m saying, “I’m an outsider to science and always will be, so I have no alternative but to accept the consensus view where it exists.” Even if I devoted years to be a great amateur biologist, I’d be foolish to imagine that I could then be Judge of Science and declare evolution to be false. Yes, of course Dr. Behe supports common descent. And yes, of course, I don’t. I don’t understand why you think that I support everything that he believes. I guess I didn’t realize the extent to which you roll your own. I don’t look at experts and say, “I will believe what they say because they are in the majority.” I look at experts and consider their views valuable. Once again, I am not appealing to ego here. I am appealing to reason. I disagree. It comes across precisely as a “Are you a man or a mouse? ?” kind of argument. All people are capable of examining the evidence and drawing their own conclusions. You don’t have to be an expert in a field to do that. I won’t declare myself judge of all science, and I marvel that you do. You seem to think that because I can examine the data and draw my own conclusions, that means I can’t be humble. I’m saying that declaring yourself the final arbiter in field in which you’re not a practitioner sounds pretty un-humble. That, of course, is nonsense. I am more than happy to admit that my views could be mistaken. That doesn’t surprise me . . . and yet there you are, still wearing your judge robes. You also seem to think that I am telling people what to do. I am not sure why in the world you would say that. Because you told me to decide for myself? Or is there a trick question in there somewhere? I am simply sharing my thoughts on issues that are of interest to me. Now, if I think that I have something of worth to share with an expert outside my field, I am happy to share that information. I talk about science a lot at my blog. I try to be a popularizer. However, I would never, by example or by suggestion, encourage anyone to decide their own science. Please run all future paper submissions by me. My turnaround at the moment is about 6 weeks. You ask for me to “leave the scientific process alone.” I can’t do that, because I am a scientist.
. . . and you’re not a biologist. This is why it is the most responsible thing to do to teach controversy in science. I’m just beating my head against the wall, aren’t I? (1) There is no controversy in biology. (2) School science class can do nothing but provide the consensus view; to do otherwise would be irresponsible. Using controversy, we can give students experience examining data and coming to conclusions. Then provide an actual controversy. I dunno—maybe string theory, for example. There are flat earthers. I could go argue with them instead. No, there is no controversy within the scientific community. I wouldn’t be able to discuss peer-reviewed studies that challenge the consensus. I haven’t seen these. Who are the peers? What are the journals? How many articles are we talking about? Good science education, then, would include controversial topics, even those that are known to be wrong. Like alchemy or astrology? Sure, ID fits into that category. But you wouldn’t be introducing these as plausible theories but rather as debunked theories, from which debunking we can learn something. Thanks for your reply Bob. Once again, I am sorry to make you so angry. That’s not what I am trying to do. You ask if I probe into quantum mechanics and relativity as much as I do evolution. I actually probe into them more, since they directly affect my research. You ask who you should “go with” when making a decision about evolution. I say that you shouldn’t “go with” anyone. I say that you should look at the evidence yourself and see what the data say. You don’t have to get a doctorate in biology to do that. You don’t even need a doctorate in biology to publish in the peer-reviewed biological literature, as demonstrated by Dr. Manning. As I have already said, you seem to think that such a doctorate is useless anyhow, since you dismiss those with doctorates in biology if they disagree with you. Now, of course, if you don’t want to bother to look at the data, you can just go with the consensus. I don’t think that’s a very reasonable thing to do on any issue, but if that works for you, it’s certainly fine with me! I don’t see why you think I am setting myself up as the Inspector of Science or the final arbiter on any issue. I don’t even consider myself the final arbiter on my own original research! That’s why I publish in the peer-reviewed literature. I want other scientists to evaluate my work and tell me what they think. That’s also why I have a blog. I want others to chime in on what they think of my analysis of scientific issues. Perhaps I now understand why you seem so angry about this. You seem to think that I am calling you a mouse because you don’t want to examine the evidence for yourself. I am not saying that at all. I am just saying that you will learn a lot more if you examine the evidence for yourself rather than just accepting the scientific consensus. You don’t have to do that, of course. That’s just my suggestion. So I am not telling you to do anything. I am simply encouraging you to try. You might be surprised at how rewarding it is! I am not sure why you think I am asking people to “decide their own science.” I am not. I am just asking people to educate themselves, examine the evidence, and come to their own conclusions. I am happy to run my future papers by you. I have your email address from your comments, so when I prepare my paper on calcium carbonate crystals, I will be happy to send it to you. I am sorry to burst your bubble, but there is a controversy on origins. That’s why you are arguing with me, and that’s why I can list all sorts of qualified biologists and other scientists who disagree with the consensus. That’s also why there are peer-reviewed papers challenging the consensus. You aren’t aware of those papers? Perhaps you should read some of them. You could start with Dr. Behe’s classic paper on how evolution occurs through loss-of-function mutations, which is opposite of what the consensus requires. You could also read Dr. Axe’s classic paper on protein sequences and how they do not behave as the consensus view of evolution requires. You could read Dr. Sanford’s paper on how natural selection doesn’t work the way the consensus view requires it to work. You could also read Dr. Minnich’s paper on how the consensus view of Lenski’s Long Term Evolution Experiment is wrong. That would at least get you started. I have no idea how many papers like that exist. I lost count quite some time ago. This is what sets ID and creationism apart from such things as the flat earth, alchemy, and astrology. Those views don’t have proponents who publish on them in the scientific literature. ID and creationism do. But the point is even if you think ID and creationism are like alchemy and astrology, the data indicate that including such controversies in science education makes for better science students. And no, if you read the review paper to which I referred, you can find the studies themselves and read them. If you do, you will find that in the studies, the incorrect topics were not presented as debunked ideas. They were presented as genuine alternatives that the students had to consider. This led to the students understanding the science better. Once again, I am sorry to make you so angry. That’s not what I am trying to do. Unfortunately, our lack of progress isn’t helping my disposition. you dismiss those with doctorates in biology if they disagree with you. How hard is this?? There is no “me” to disagree with. I have no ego involved here. My opinion is the scientific consensus, no more and no less. When it changes, I change. You want me to change? Then change the consensus—easy. I don’t see why you think I am setting myself up as the Inspector of Science or the final arbiter on any issue. Because *you* decide whether evolution is correct or not, not the scientific community. You seem to think that I am calling you a mouse because you don’t want to examine the evidence for yourself. Not really. I don’t see you mocking me except to the extent that you insist that *I’m* the one who should decide science for myself (and perhaps I’m some sort of wimp if I don’t). My point is that the Appeal to Ego is fallacious. “C’mon, Bob! Decide for yourself!” is ridiculous when there’s a scientific community vastly more capable of evaluating the evidence. For me to override them is a ludicrous idea. I am just saying that you will learn a lot more if you examine the evidence for yourself rather than just accepting the scientific consensus. I’ve been studying Creationism for 20 years. That discussion is what made me an atheist. I hang out with YECs at two local Meetups when my schedule allows. I’ve been to a handful of local Creationist conferences. I guess my point whooshed past you. For me to evaluate your papers is ridiculous. Don’t you get it? I can’t judge something in a field for which I’m unqualified to judge. If, as in your plane example, you think I could point out a way to make the argument clearer or maybe I have an example from left field that might illustrate something better, sure, that’s possible. But for me to correct you on the fundamental assumptions on which your argument rests is ridiculous. Why should I bother? I am sorry to burst your bubble, but there is a controversy on origins. Yeah? Show me that in Science or Nature or any other scholarly journal. Science isn’t done when two non-biologists haggle, as we’re doing now. The Creationism/ID community’s Machiavellian project to sow distrust in evolution among the public has been impressively successful, but that’s not science. That’s why you are arguing with me, and that’s why I can list all sorts of qualified biologists and other scientists who disagree with the consensus. All sorts of biologists? Like how many? Ten? Twenty? Why even bother with the argument when the number of practicing biologists who think that evolution is crap is a tiny fraction of the total? That’s also why there are peer-reviewed papers challenging the consensus. You aren’t aware of those papers? Thanks for the papers. You know what I think I’ll do? I’ll let the experts digest them since it would take me hours to just figure out how much of an attack (if any) they make on evolution. When they think that the consensus needs changing, I’ll change right along with it. I don’t know how much fairer I can be. I do think this reply has helped me understand why you are so angry over all this, Bob. Perhaps I can address that first. You are trying to claim that you don’t have any personal stake in this. You are just following the consensus, so I am not arguing against you. However, your emotion demonstrates that isn’t true. You have a very personal stake in this. You seem to think that because you follow the consensus, everyone has to. Unfortunately, that’s not the role of a scientist. A scientist should always question the consensus, because that’s when real progress is made. Now, of course, sometimes a scientist questions the consensus but finds that the consensus opinion is consistent with the data he knows. However, sometimes he questions the consensus and finds out the data are not consistent with the consensus. At that point, he has an obligation as a scientist to work against the consensus. That’s what I am doing, and that’s what expert biologists like those in the ID and creationist movements are doing. That seems to upset you, because you think no one should be doing that. You say that I am setting myself up as final arbiter because I “decide whether evolution is correct or not, not the scientific community.” However, you are the one who is acting as final arbiter. You have decided that I shouldn’t question the consensus when it comes to origins, and you are telling me to stop it. However, that’s my job as a scientist. I am supposed to look at the data and come to the best conclusion based on the data. Based on my interpretation of the data, materialistic evolution is not consistent with the data. Thus, as a scientist, it is my job to try to change the consensus. Interestingly enough, you ask me to do that from time to time (“You want me to change? Then change the consensus—easy”), but then you seem to be upset that I am actually trying. As a side note, I don’t want you to change. I have told you countless times that if you just want to follow the consensus, that’s fine. It’s just not something I can do as a scientist. Once again, this isn’t an appeal to Ego. It is an appeal to reason. We all have the ability to examine evidence and make decisions for ourselves. Now as I have said, if you don’t want to do that, that’s fine. However, don’t put on the black robes and tell everyone else that they must do the same. If I choose to question the consensus, I am free to do so. In fact, as a scientist, I am obligated to do so. You say that you have been studying creationism for 20 years. That may be true, but you obviously need to change your study habits. You didn’t seem to know about any of the peer-reviewed papers questioning the consensus. If you didn’t know that, whatever you have been studying isn’t very useful from a scientific point of view. You seem to think that asking people to come to their own conclusions is asking them to decide their own science. That’s not it at all. I am asking people to use the scientific method. That’s not deciding science. That’s using the established method of science to make rational decisions. It is amazing that you disagree with that! And here we come to another one of your major misconceptions about science. Since you haven’t really done any science, I can see why you have this misconception, but it is a misconception nevertheless. It is not at all ridiculous for you to evaluate my papers. Anyone who can read and think can make a contribution to science. Let me give you an example. I was working with a group of gifted and talented high school students, and I had discovered something in my lab that I couldn’t find anywhere in the scientific literature: red-hot platinum would stop glowing as it cooled, but if you held it above some liquid alcohol, it would start glowing again. I showed this to the students and offered them my explanation. After class, one of the students (a JUNIOR IN HIGH SCHOOL) came to me and argued that what I had said couldn’t be right, because of some math that she had done. I checked her math, and she was correct. As a result, I hired her over the summer so she could help me figure out the effect. That’s what led to the gas-phase catalysis paper I linked in an earlier comment. In this case, then, a lowly junior in high school was able to spot a mistake I made, help me figure out the real explanation for a chemical process, and advance our scientific knowledge of chemistry. That’s what people who read and think can do. As a researcher, I have worked with several students who have very little experience and not much knowledge. Nevertheless, some of them have made REAL contributions to my research. It’s not a question of expertise. It’s a question of whether or not you want to spend the time learning and thinking. You asked me to show you the controversy in any scientific journal. I showed you several examples in my previous comment, and your response was to ignore them and “let the experts digest them.” Now as I have repeatedly said, that’s fine for you, if that’s what you want. I am sure you have more time for other pursuits because you don’t engage in the scientific process. However, don’t play judge and jury and tell the rest of us that we can’t read the papers, learn from them, and communicate their results to others. That’s how the consensus gets changed, and as a scientist, I have an obligation to try to change the consensus when I think it is wrong. Hey Dr. Wile, if Bob doesn’t want it (and even if he changes his mind and does), feel free to send me your paper on calcium carbonate crystals after you finish preparing it! I will. I am happy to get any feedback. your emotion demonstrates that isn’t true. Because imagining that every citizen has a warrant to decide their own reality isn’t a great idea for society. You seem to think that because you follow the consensus, everyone has to. That seems to upset you, because you think no one should be doing that. You say that I am setting myself up as final arbiter because I “decide whether evolution is correct or not, not the scientific community.” However, you are the one who is acting as final arbiter. Uh huh. Because I yield to the consensus view of the experts? Interestingly enough, you ask me to do that from time to time (“You want me to change? Then change the consensus—easy”), but then you seem to be upset that I am actually trying. ?? I don’t expect *you* to change the consensus. I meant that, when the consensus view of biologists changes, I’ll change. It’s just not something I can do as a scientist. Suddenly the weight of the entire field of science is on your shoulders? You have a field in which you’re an expert. Great—I’m delighted that you’re working to make sure that errors in your field are highlighted and corrected. Once again, this isn’t an appeal to Ego. It is an appeal to reason. We all have the ability to examine evidence and make decisions for ourselves. We all have expertise in some fields and not in others. Let’s have a little humility and realize that, unlike Atlas, we’re not carrying the entire world on our shoulders. If I choose to question the consensus, I am free to do so. In fact, as a scientist, I am obligated to do so. For us to each decide our own science is an idea worth disagreeing with. 1. I’m not qualified to evaluate them. My idea: let the experts decide. 2. “Controversy”? What fraction of papers in legitimate biology journals question evolution? I’m not talking about something like punctuated equilibrium, which is a controversy *within* evolution but rather something that challenges the very core of evolution, as Creationism does. don’t play judge and jury and tell the rest of us that we can’t read the papers, learn from them, and communicate their results to others. You want to be a popularizer of science in a field in which you’re not an expert? Great. I do that myself. It’s when you, as a non-expert, reject the consensus of the experts that eyebrows should be raised. Thanks for your reply, Bob. Obviously, you have a lot to learn about science. No, making scientific decisions is not creating your own reality. It is simply exercising your ability to reason. And no, laymen do not have to follow the consensus, because laymen have the ability to reason as well. And once again, just because a topic is not in my field of expertise, that doesn’t limit my ability to evaluate it scientifically. If that were the case, there wouldn’t be so many examples of scientists crossing from one field to another, such as my discussion of Dr. Manning, a physical chemist, becoming one of the most important figures in molecular biology. The fact is that you don’t have to be an expert in a field to be able to evaluate the field. You just have to be willing to read, learn, and think. I don’t understand why you think I believe I have the weight of the scientific world on my shoulders. I most certainly do not. I am one scientist, and I am doing my part to advance our scientific knowledge. That doesn’t put the weight of the scientific world on me. However, it does give me several obligations, and one of them is to attempt to change the scientific consensus when I think it is wrong, regardless of the field. And once again, I am not asking people to decide their own science. I am asking them to use the scientific method to make rational conclusions. Once again, it’s amazing that you don’t want people do do that! 1. You are qualified to evaluate scientific papers, if you take the time to learn and read. If a junior in high school can do that, you can as well. If you don’t want to do that, that’s fine. However, those of us who want to do so are free to do so, regardless of whether or not you want us to. 2. Yes, controversy. It doesn’t matter what percentage of papers question the consensus. What matters is that there are legitimate scientists out there doing legitimate scientific research that questions the consensus. That’s the very definition of scientific controversy! You may not want to admit that the controversy exists, but it does. When someone is so devoted to the scientific consensus that he isn’t even willing to admit the existence of a controversy, eyebrows should be raised.